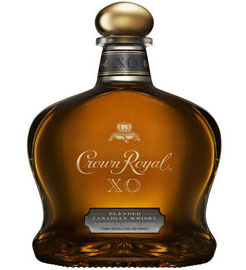 Whisky lovers are often amazed when they learn that Canadian whisky is the best selling whisky style in North America. Indeed, from small beginnings more than two centuries ago Canada has become the second largest whisky-making nation in the world, next only to Scotland. Yet the story of Canadian whisky is shrouded in mystery and myth. Like Canadians themselves, until very recently, Canada’s whisky has largely flown under the aficionado’s radar. European settlers arriving in Canada in the 18th & 19th centuries often brought small stills with them. Although many of these early settlers came to Canada from Scotland and Ireland, they distilled rum, not whisky. They were more interested in making alcohol than whisky, and took full advantage of easy sea access to Caribbean molasses to do so. However, as settlers began moving west into Ontario where molasses was more difficult to obtain, distillers turned to grain to make their spirits, and Canadian whisky making was born. This time these first Canadian whisky makers were neither Scots nor Irishmen, but English and German settlers. In those days, wheat grew abundantly in Canada and it became the primary grain for Canadian whisky making. It wasn’t until German and Dutch immigrants suggested adding small amounts of rye-grain flour to Canadian whisky mashes that the whisky style we know today emerged. This wheat whisky with just a bit of rye grain quickly became known simply as “rye,” a name that has stuck right up until today. Distillation in the U.S. was badly disrupted during the American Civil War, so thirsty Americans turned to Canada as a reliable source of whisky. 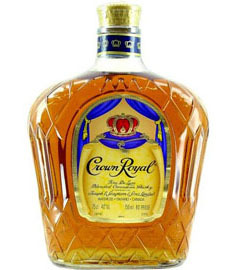 By 1865, Canadian whisky was the best selling whisky style in America and it remained so for a century and a half until bourbon sales took the lead in 2010. 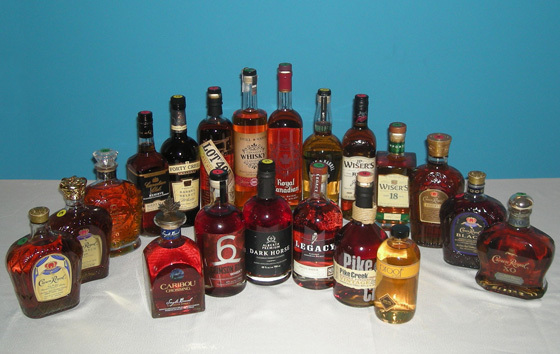 Prohibition is mistakenly credited with the growth of Canadian whisky as a prominent whisky style. However, nothing could be further from the truth. In reality, Prohibition threatened the formerly lucrative cross-border sales of Canadian whisky established during the Civil War. When the U.S. declared Prohibition in 1920, suddenly Canada’s largest market dried up. Yes, American bootleggers did come to Canada to buy whisky but volumes were very small compared with the pre-Prohibition era, and much of the whisky reaching the U.S. from Canada during Prohibition were imported Irish and Scotch whiskies. Sales of Canadian whisky rebounded when Prohibition was repealed. The 1950s, 60s and 70s were particularly good for Canadian whisky, largely under the guidance of drinks giant, Seagram’s. It was the time of Madmen and cocktail culture, and Canadian whisky, already strong, thrived. In the 80s and 90s though, preferences began to change. Scotch was becoming a consumer favorite and Canadian whisky sales fell into slow decline. Encouragingly, this trend has begun to reverse in recent years. In 2013, Americans bought almost 17 million 9-litre cases of Canadian whisky, and even more impressive, respected connoisseurs have begun to revisit top Canadian brands. They are beginning to realize that like single malt scotch, Canadian whisky is generally the product of a single distillery – something singular and therefore something special. 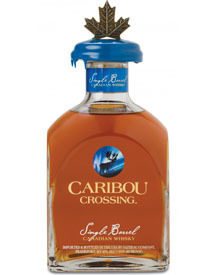 What Else Makes Canadian Whisky Special? Unlike their U.S. counterparts, Canadian whisky makers do not use mash bills. 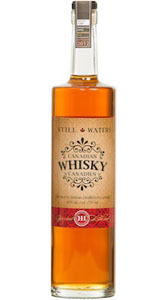 In Canada each type of grain is distilled separately and matured in optimal conditions for that particular spirit. Only then are they mingled together as mature whisky. American distillers blend their grains in a mash bill before making whisky. Canadian distillers blend them afterwards. Just as interest in whisky made in Canada’s major distilleries is increasing, micro distilling is growing in Canada too. There were more than 30 artisanal distilleries in Canada at last count. About half a dozen of these make or are planning to make whisky. Because Canada does not unify all of its whisky laws, rules, and regulations in one tidy legislative piece, some people believe, falsely, that whisky making is unregulated in Canada. Micro-distillers in particular know that is not the case, as they must wade through masses of seemingly unrelated laws, rules and regulations to ensure they operate within the law. These laws can make it very expensive to start a new distillery in Canada. For instance, in 1890, a full generation before the same requirement was enacted in Scotland; Canada became the first nation to require that whisky be aged. Today, this law means that Canada’s micro distillers must produce vodka, gin or other white spirits to generate income while they wait for their whisky to mature. Still, new excitement surrounding Canadian whisky and craft spirits in general is encouraging more and more new distillers to stake a claim on the market. These are exciting times for Canada’s distillers. Canadian whisky is heading back into the heady days of the fifties and sixties as new micro distillers emerge and the major brands release more and more connoisseur-quality whiskies. The new whiskies, while bigger, bolder and much more flavorful than what Canadian whisky is commonly thought to be, still retain the Canadian whisky style. The future is looking very bright for Canada’s distillers, and brighter still for Canadian whisky lovers and whisky aficionados alike. available in hard cover & paperback at your favorite bookstore and online booksellers. The Fifty Best held a “blind” tasting of 20 Canadian whiskies with 19 pre-qualified judges. Strict tasting rules were applied. The order of service was established beforehand by lottery. Each of the whiskies were poured into fresh glasses from new sealed bottles, and served slightly above room temperature. Only ice water, neutral unflavored unsalted crackers and bar snacks were available to cleanse the palate. The judges tasted through two flights of 7 Canadian whiskies and one flight of 6 Canadian whiskies. The judges wrote down their impressions of each product on score sheets. The scoring was done on a 5-point system, with 5 as the best. Double-Gold and Gold medals were awarded according to a set range of final point scores received from the judges. Since the scoring was high overall, there were no Silver or Bronze medals awarded in this tasting. The tasting notes that follow are summaries of the judges’ opinions, with all replicated notes eliminated. Also included for each whisky are commentaries provided by Davin de Kergommeaux. 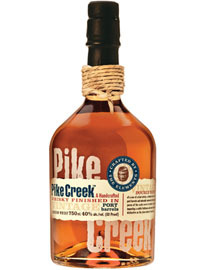 Tasted blind, Pike Creek is often mistaken for a sherry cask single malt. Maturing in unheated warehouses it benefits from the summer heat and frigid Canadian winters producing a richly flavored whisky with flavors that vary with the weather. Nose: Vanilla, honey, caramel, butterscotch, toffee, creamy, cream soda, buttery popcorn, powdered sugar, sugar cane, pastry, marzipan, nutty, floral, nutmeg, toast, oak. Palate: Creamy vanilla, buttery, cream, buttered biscuit, nougat, toffee, honey, treacle, molasses, dates, ripe banana, sweet nuttiness, macadamia nuts, toasted nuts, cocoa, rye flour, herbal, light spice, oak, full flavored, very well balanced, easy drinking, fantastic. Finish: Buttery, vanilla, nutty, sweet nuttiness, pepper, creamy, smooth, delicate, soft, gentle, easy drinking. A shining star in Canada’s micro-distillery scene, 66 Gilead’s spirits range from vodka to shochu. 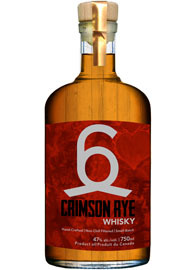 Crimson Rye, their first rye whisky, is made from 100% rye grain and aged 42 months in the warmth of the distillery itself. Nose: Caramel, vanilla, honey, molasses, nougat, maple, cut oats, roasted nuts, coffee, rye, clove, sweet spice, carnations, patchouli, anise, earthy, leather, oak. Palate: Vanilla, maple, treacle, cream candy, cherry, apricot, dried apricot, dried fruit, citrus, roasted corn, ginger, pekoe tea, cinnamon, walnut, nutmeg, clove, white pepper, black pepper, spicy, oak. Finish: Spice, spice cake, patchouli, sweet nuttiness, pepper, smooth. Twenty years ago, Forty Creek whisky maker, John K. Hall went bar to bar getting people to taste his whisky. 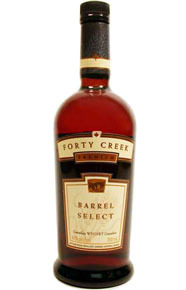 Forty Creek’s huge success culminated in its sale in June to Campari for a cool $180 million, all on the strength of this gorgeous mixing whisky. Nose: Maple syrup, honey, cane sugar, vanilla, toffee, caramel, butterscotch, nougat, toasted marshmallow, peanut brittle, butter, corn, rye, herbal, walnut, dark rum, oak. Palate: Molasses, brown sugar, powdered sugar, honey, vanilla pudding, custard, buttered popcorn, peanut brittle, walnut, rye, clove, allspice, pepper, spicy, musk, leather, oak, oak tannins, rich, yummy. Finish: Toasty, toasted vanilla, light spice, spicy, tart, smooth. 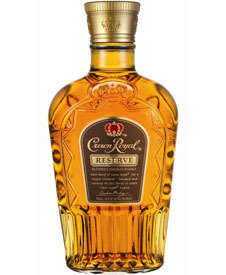 When introduced to the U.S. in the 1980s, Reserve was a step up from Crown Royal Deluxe and a whisky lover’s blend of whiskies, all more than 15 years old. Nose: Cherry, cola, maple, molasses, vanilla, cream, caramel, apricot, pineapple, red plums, ginger, sweet nuttiness, toasted almond, cinnamon, clove, pepper, grain, cedar, oak. Palate: Ripe banana, dried fruit, honey, treacle, vanilla, sweet cream, cream, buttery, caramel, nougat, maple, cola, hint of sherry, herbal, sweet nuttiness, cocoa, light spice, pepper, oak, nice, well balanced. Finish: Molasses, creamy, velvety, walnut, clove, pepper, spice, zesty, smooth. 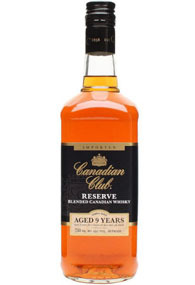 Hard rye and sweet toffee are the hallmarks of this popular whisky, a newish version of the Canadian Club whisky that Hiram Walker began making at his Windsor distillery in 1858. Nose: Caramel, toffee, molasses, vanilla, honey, apricot, cherry, dried fruit, corn, honeysuckle, cinnamon, rye, black pepper, herbal, floral, grain, nutty, oak. Palate: Cherry, strawberry, sugar cane, cream, buttery, toffee, cocoa, barley, wheat, rye, roasted nuts, ginger, clove, mint, cognac, white pepper, spicy, smoke, well balanced, elegant. Finish: Cream, vanilla, toffee, mint, spicy, leather, complex, soft, smooth. 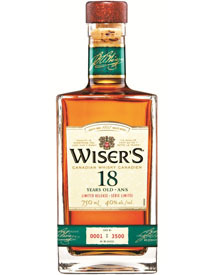 Wiser’s 18 is the quintessential fragile, elegant Canadian whisky. Long on clean crispy oak with tingling peppery spices and subtle oak caramels. Nose: Cherry, apricot, plum, dried fruit, toffee, cream, cream soda, sugar cane, baked apple pie, floral notes, roasted sweet nuts, cinnamon, barrel age, faint oak, smoky. Palate: Honey, sugar cane, demerara sugar, vanilla, caramel, toffee, nougat, cherry, rum notes, cocoa, walnut, mixed nuts, nutty, cinnamon, clove, mint, oak, elegant. Finish: Dried fruit, sugar cane, creamy, mint, herbaceous, nutmeg, black pepper, spicy, complex. This big, bold whisky is a blend of 6-year-old and 12-year-old all rye grain whisky with a smidgen of corn whisky added to smooth out the mouth feel. Nose:Molasses, brown sugar, honey, sweet champagne truffles, banana, pear, corn, rye, walnut, cinnamon, clove, ginger, rum, pine resin, green bell pepper, grass, cigar, nutty, earthy, cedar, oak wood. Palate: Sugar cane, molasses, honey, vanilla, toffee, citrus, pear, cherry, sweet green apple, plantain, toasted coconut, spice cake, sweet nuttiness, rye, hickory, cinnamon, white pepper, spicy, mint, cigar smoke, pine resin, cedar, oak. Finish: Honey, butterscotch, pepper, spicy, toasted nuts, woody, oak. Sam Bronfman built his first distillery in LaSalle Quebec, just outside of Montreal. The distillery is closed now, but its warehouses remain full of rare ageing whiskies including the luscious old rye that was used to make Crown Royal LaSalle. Nose: Nougat, toffee, treacle, sugar cane, honey, vanilla, apricot, dates, buttered popcorn, toasted almond, field grains, plantains, flowery, honeysuckle, herbal, white pepper, coffee, oak. Palate: Citrus, orange, green apple, honey, creamy, toffee, mixed grains, rye, toast, toasty malt, roasted nuts, almond, clove, pepper, spice, ginger, mint, floral, sherry, oak profile, lush. Finish: Toast, grain, rye flour, cake, light spice, nutmeg, peppery. 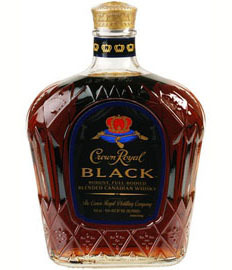 Rich, dark and almost rum like, Crown Royal Black sipped in a cocktail or sessioned with Coke brings a new dimension to a long-time favorite. Nose: Honey, sugar cane, vanilla, molasses, cocoa, treacle, dried fruit, fig, banana, green apple, subtle floral notes, light cinnamon, nutmeg, rye flour, toast, light grain, hay, fresh wood, rich oak. Palate: Buttery, creamy, butterscotch, toffee, nougat, sugar cane, maple, vanilla, cookies, apricot, orange, fig, dates, barley, rye notes, toasted grain, sherry, mint, spicy, oak, lush. Finish: Honey, sweet nuttiness, toasted nut, almond, creamy, rich, spicy, oak, nice. Lush, so smooth it’s almost slippery, and loaded with fruits and spices. 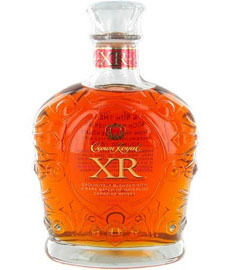 Crown Royal XO is finished in Cognac casks, as was the former Cask 16 which it replaces. Nose: Nougat, toffee, honey, brown sugar, maple, subtle sugar cane, honey lemon drops, honey, wheat, toasted grains, grain, sweet nuttiness, spice, dark wood, cedar, toasted oak. Palate: Plum, sweet cherry, apricot, citrus, orange zest, cantaloupe, green apple, ginger, honey, vanilla, sugar cane, caramel, nougat, cream, chocolate, toast, rye bread French toast, almond, pecan, nutmeg, black pepper, spicy, light oak. Finish: Vanilla, dried fruit, fruit, grain, roasted nuts, toasted notes, oak, pepper, spicy, nice spice profile, not overpowering, colorful, very nice. 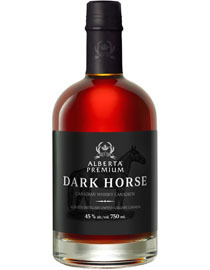 This is the whisky of rural Canada. A shooter, a sipper and a dynamite mixer. Nose: Sugar cane, honey, maple, vanilla, cream, butterscotch, caramel, touch of banana, citrus, ginger, nutmeg, black pepper, spicy, leather. Palate: Creamy vanilla, honey, honeycomb, sugar cane, nougat, tropical fruit, plum, citrus, ginger, sherry, rye, peppercorn, hazelnut, roasted nuts, deep cocoa, oak. Finish: Sweet nuttiness, creamy, toffee, fruity, mint, light herbs, subtle spice, cedar, very smooth, very nice. 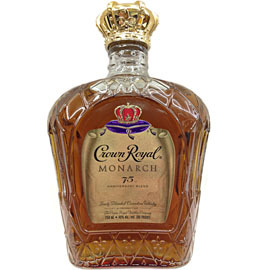 The most flavorful Crown Royal ever, Crown Royal Monarch is rich in rye whisky distilled in Gimli Manitoba in Canada’s last working Coffey still. Nose: Brown sugar, molasses, apricot, orange-honey, strawberry, cherry, tropical fruits, cinnamon, rye, nuttiness, herbs, grass, pepper. Palate: Buttery, honey, cherry, nuttiness, rye, cinnamon, spicy Cinnabon, sherry, pepper, white pepper, clove, woody, oak, lush. Finish: Sweet almond, molasses, rye, slightly spicy, oak barrel, creamy, soft. Sazerac imports this lovely session whisky into the US in bulk, for bottling. So, although it is Canadian whisky, it is not available for purchase in Canada. Another lure for the cross-border shopping crowd. Nose: Rye, nutty, honey, vanilla, molasses, maple syrup, maple, honeysuckle, floral, subtle citrus, cinnamon, white pepper, white ash, seasoned oak, oak. Palate: Creamy vanilla, vanilla, buttery, butterscotch, nougat, honey, maple, banana, banana syrup, green apple, slight citrus, hint of sherry, toasted walnuts, bread, rye flour, rye, pepper, black pepper, spice, oak. Finish: Creamy vanilla, buttery, plums, licorice, oak, zesty, spicy rye profile, elegant. Proof screams citrus fruit. 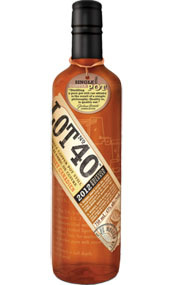 Sold in a 500 ml bottle, it is a popular Friday night party dram for Torontonians who don’t want either to over-imbibe or to have leftovers. Mixes better than it sips. Nose: Honey, vanilla, Werther's Original candy, corn, floral, light lemon, citrus, mint, chocolate, roasted nuts. Palate: Fruity, orange, grapefruit, lemon candy, lemon, mango, honeydew, star fruit, apple pie, honey, floral, rosewater, white pepper, hint of cinnamon, clove, spicy, leather, light oak. Finish: Passion fruit, cherry, toasted almond, lavender, cinnamon, candied ginger, mint, pepper, zesty, complex, smooth. An upscale blend in a heavy upscale bottle for those occasions when you want to make a statement. Nose: Cotton candy, caramel, butterscotch, maple syrup, honey, sugar cane, vanilla, marshmallow, fresh flour, toasted coconut, roasted nuts, walnut, black walnut, dried fruit, spice, gardenias, sherry, tobacco, leather, oak. Palate: Creamy vanilla, honey, sugar cane, toffee, caramel, nougat, taffy, maple, butternut, walnut, sherry, ginger, cinnamon, pepper, light clove, hint of rye, rye flour, oak, lush, well balanced. Finish: Vanilla, toffee, creamy, woods, smoky, complex, smooth. 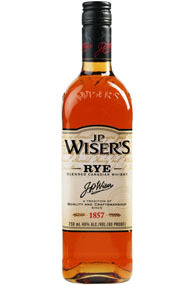 This wonderful all-rye whisky is made from a mash of 90% rye grain and 10% malted rye. A connoisseur’s and cocktail mixer’s favorite. Simply bursting with flavor. Nose: Nougat, vanilla, caramel, molasses, brown sugar, treacle, sugar cane, ripe banana, green apple, orange, cherry, dried fruit, walnut, fresh grains, nutmeg, poplar wood, bright acidity. Palate: Sugar cane, caramel, vanilla, banana, cherry, dates, coconut, walnuts, sweet pecans, nutty, toasted nuts, heavy toast, herbs, rye, rye flour, white pepper, clove, cinnamon, spicy, leather, oak, wood barrel, rich. Finish: Caramel, honey, toffee, dried fruit, orange, citrus, sweet nuttiness, tangy, spice, smoky, complex, smooth. Rather than experiment with their own precious whisky, the distillers at Still Waters honed their skills blending sourced whisky with their home-distilled spirit. 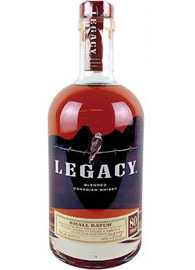 The resulting blend that has found favor from coast to coast in Canada. Nose: Caramel, honey, sugar cane, nougat, vanilla, maple, cocoa, plum, apricot, dried fruit, corn, wheat, oatmeal, nutmeg, soft pepper, floral, birch wood. Palate: Rye, grain, maple, sugar cane, honey, vanilla, pecans, strawberry, ginger, mint, cinnamon, clove, sage, rosemary, spice, black pepper, oak, lush. Finish: Soft caramel, toast, Graham cracker, cinnamon, spicy, oak, smooth. Far and away Canada’s best selling, and Hillary Clinton’s go-to whisky, Crown Royal is rich in bourbon-like caramels, spices and fruitiness. Nose: Ripe banana, papaya, black cherry, plum, green apple, green bell pepper, caramel, butterscotch, molasses, cream, powdered sugar, rye flour, nutmeg, leather, oak. Palate: Toffee, caramel, butterscotch, nougat, honey, maple, vanilla, cream, toasted marshmallow, apricot jam, pastry, cherry, citrus, cinnamon, sweet nuttiness, nuts, clove, peppercorn, herbal, grassy, wood, oak. 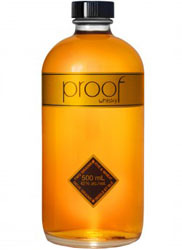 Finish: Vanilla, creamy, sweet pastry, fruity, cinnamon, black pepper, light smoke, smooth. Lush, smooth and hugely mouth filling with an abundance of aromas and flavors. Nose: Ripe banana, tropical fruit, apricot, dried fruit, maple candy, corn, yellow bell pepper, tropical flowers, floral, almond, barley, light cinnamon, spicy, smoky, oak. Palate: Molasses, sugar cane, butter cream, creamy, vanilla, toffee, apricot, banana, walnuts, rye, rye flour, cinnamon, light spice, wood, oak, well balanced, smooth, very mellow. Finish: Toffee, nutty, malt, coffee, light pepper, spice, dry, delicate, smooth. Single malt, yes, but it’s definitely not Scotch. Maturing in bourbon barrels in the warmth of the still house, Still Waters Stalk & Barrel whisky is a rich, malty, toothsome treat, mature far beyond its 3 years. Age statements be damned: This is good stuff. Nose: Banana peel, ripe banana, lemon, citrus, apple cider, ginger, floral, patchouli, herbs, dry spice, cocoa, leather, wood, oak. Palate: Toffee, pear, banana, apricot, barley, rye notes, black pepper, white pepper, pepper, spice, ginger, patchouli, wood, teak, oak. Finish: Toffee, marzipan, rye, roasted nuts, fresh herbs, zesty, spicy, leather, wood, smoked wood, bright acidity, dry profile, amazing.